I’m a big fan of Inbox Zero and I wish I didn’t have to give e-mail so much of my attention, but since I’m in charge of support for my company it’s a priority for me. That may make me a bit of an “E-Mail Monkey“, but so be it. It’s a point of pride that I, and the rest of our team, respond so quickly to customer feedback. That’s not to say that I’m not envious of people who can process their e-mail just twice a day. If support wasn’t one of my roles, I would jump at the opportunity to do the same. Since I’ve chosen not to, there are a few steps that I take to minimize the interruptions. One of the techniques I was a big fan of was to use an app called Notify. 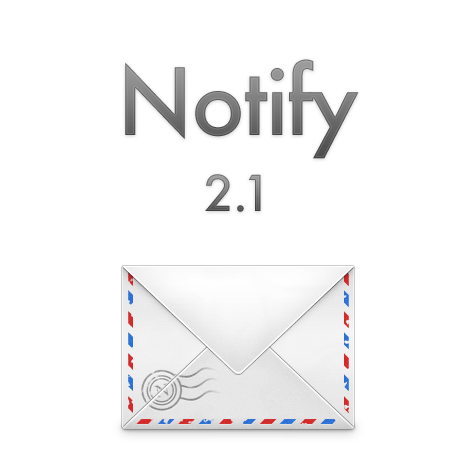 Nofity.app would sit in your menu bar and would check my e-mail accounts and notify me when I had mail via Growl. Of course leaving my e-mail client open would obviously do the same thing, but I liked the fact that I could keep it closed. A simple notification would let me know if the e-mail was urgent, but I didn’t have the constant reminder of a badge notification that I had X number of unread messages. If the message was urgent, then I could launch Mail.app and address it, but if it wasn’t then I could leave well enough alone until I was ready to process my mail. Again, it was a small thing, but I found it very handy to help me stay focused throughout my day. Unfortunately, the developer abandoned the software on May 11, 2011 and it no longer functions since I upgraded to Mac OS Lion. The other day I was lamenting the fact that I still miss not having this little utility. I did a few Google searches to see if I could find an alternative, but came up empty. That was certainly a disappointment, but I was happy to find that I wasn’t alone. You aren’t alone. I miss notify too. I still miss it too. Me too Tapis. Me too.